Several students have mentioned wanting to create a low-poly self portrait, so I have created a tutorial to show you how to achieve this effect in Illustrator. You do not have to use this style – it is one of many options. You are responsible for publishing a PDF of your progress to your blog today, regardless of the style you choose to work in. Planning blog posts have been graded. If you did not publish a planning blog post, you received a zero. You can still publish a planning blog post, but you will only receive half credit because it is late. Remember, the planning blog post is worth 20% of your final project grade. In the bottom left corner, set your fill options to “outline only,” and change the outline color to something bright that will contrast with your skin tone. Use the pen tool to draw triangles over the entire portrait. Each triangle should represent a shift in value. Use the black arrow to select a triangle. Use the eyedropper tool to select a color in the middle of the triangle. This will change the fill color. Continue until you have filled in all of the triangles. Select the white arrow. Hold down shift and select the points you wish to align. Points that are not selected should remain white, and points that are selected should change to a color. Click vertical in the alignment palette. Click horizontal align in the alignment palette. Continue until you have filled in all the gaps between triangles. Save your file as a PDF and upload your progress to your blog. If you have not already done so, you must publish your idea for your Vector Self-Portrait. This blog post is worth 20% of your final project grade, and no credit will be issued for proposals published after today’s class. Yolie, Bayleigh, and Brian have great examples of project planning posts. 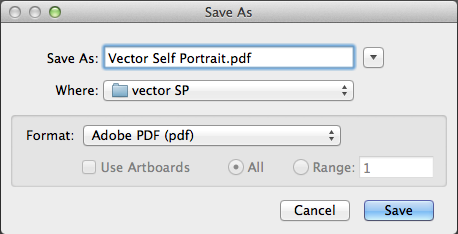 Today we will begin creating our vector self-portraits in Adobe Illustrator. Make a folder (Right-click on the desktop, New-> Folder) drag your reference photo into this folder, and save your Illustrator document to this folder. You must keep your Illustrator file and your reference photo in the same folder, or the photo will disappear the next time you open the Illustrator document and you will have nothing to trace! Place your reference photo. File -> Place. It may not fit the dimensions of the paper exactly. That is ok. You can scale the image to fit by holding down the shift key and scaling from the corner. Make sure you do this or you will distort your proportions! Also, pay attention to the box with the black border – the black border defines the edges of your paper, and anything that extends beyond the border will be cut off. You may also want to create and name a new layer for each image you plan to vectorize. You can group sub-layers within layers, and close and expand these layers like folders to organize your file. Start naming and organizing your layers right away, or your project will become a mess with hundreds of layers. If you can’t figure out what layer you are on, the teacher will not be able to help you, either! Use the eyedropper tool to select and match a color from your reference photo. At the end of class, save your file as a PDF (File -> Save as -> PDF) and upload the PDF to your blog. 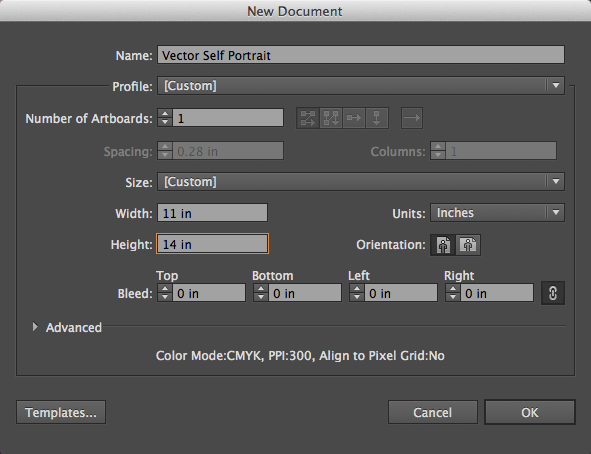 Essential question: How can I create a stylized self-portrait that displays unity with Adobe Illustrator? For our next project, we will create a vector self portrait in Adobe Illustrator. You will start with a photo or sketch of yourself, place the image into illustrator, and then trace over it with the pen tool. You will decide the style – realistic, expressive, cartoon, etc, but you must pick a look you are going for at the start of the project, as it will determine the techniques you use to create the project. Daily progress posted to class blog. This project spans 11 classes, and you will need at least 10 daily posts. (This gives you one freebie if you are absent or late once over the course of the project.) You must upload a PDF of your progress to receive credit. No credit will be given for blog posts that say things like, “the computer crashed and I lost my work so there is nothing to upload.” It is your responsibility to back up your work to a USB Drive or your Google Drive. examples of intended color scheme. The design seeds website is a great place to get ideas for sample color schemes. This planning blog post is worth 20% of your project grade. If you have not yet posted a photo of your completed street art project, along with a 150 word artist statement about the project, you should do so ASAP. Yolie and Brian have great examples on their blogs. I will grade the project within a week of you posting these things to your blog. Today you will photograph your progress on your street art project and post it to your blog. This checkpoint is worth 25% of your final project grade. Seniors must post their progress before going to the gallery to hang the show. The last class day for this project is Thursday, February 11th (BD Days) or Friday, February 12th (AC Days). Size of the artwork ties fits the concept and medium, but no smaller than 12×12″ and no larger than 18×24.” Generally, if you plan to use colored pencils, lean towards a smaller size, and if you plan to paint, consider the 18×24″ size. Displays appropriate complexity for 11th and 12th grade work. (While it is ok to create technically simple work such as Keith Haring’s, if you choose to go this route, your work should be polished, show solid craftsmanship and understanding of the elements and principles of design, and be conceptually sophisticated.) A “project” that is completed in a fraction of the allotted time will not receive a passing grade.